I am a philosopher of cognitive science, specialized in enactive or embodied cognition. My niche is the philosophy of skillful unreflective action. Skillful unreflective action is a young, broad domain with lots of potential because of its significance for cognitive science and progress on fundamental issues in philosophy such as intentionality, context-sensitivity, normativity, and freedom. I have published on all of these topics in international philosophy journals. At the bottom of the page you will find selected publications. My perspective on skilled action has also opened up a new avenue for philosophical and translational research on architecture, via an (NWO-VENI funded) embedded project at architecture, art & research studio RAAAF. This allowed me to develop an affordance-based philosophical perspective on the potential of reusing vacant buildings, which is an urgent societal issue in The Netherlands. My work on everyday skillful action is also relevant for the under investigated topic of the way the built environment can promote more active workspaces, life styles and sustainable health. Annother novel field of research opened up by my work on skillful unreflective action is the phenomenology of patients with Deep Brain Stimulation (DBS), a pioneering project that is unique in the world. This short BBS-commentary article sketches its significance for understanding the relation between mind and world, context-sensitivity and the philosophy of social cognition. Figure 1: Through skilled intentionality one gets a grip on a field of affordances. Sketch of conceptual framework to be refined (Rietveld, 2013; Bruineberg & Rietveld, 2014, Frontiers in Human Neuroscience; inspired by: Thompson, 2007, 2011; Chemero, 2003, 2009; Dreyfus, 2007; Tschacher & Haken, 2007; Rietveld, 2008a/b/c). The aim of my most recent research plans is showing how my understanding of embodied cognition as skilled responsiveness to the many affordances available in our surroundings also sheds light on skilled ‘higher-level’ cognition and reflection in action, which are important open issues in enactive embodied cognition. I will also continue the development of my enactive or embodied approach to architecture. Read more at the Introduction page of this website. Rietveld, E. & Kiverstein, J. (2014) A rich landscape of affordances. Ecological Psychology 26 (4), pp. 325-352. De Haan, S., Rietveld, E. & Denys, D. (2014) Stimulating good practice: What an EEC approach could actually mean for DBS practice. American Journal of Bioethics Neuroscience 5 (4), pp. 46-48. Frijda, N., Ridderinkhof, K.R., & Rietveld, E. (2014) Impulsive Action: Emotional Impulses and their control. Frontiers in Psychology 5 (518), pp. 1-9. De Haan, S., Rietveld, E., Stokhof, M., & Denys, D. (2013). The phenomenology of deep brain stimulation-induced changes in OCD: an enactive affordance-based model. Frontiers in Human Neuroscience, 7 (653), pp. 1-14. 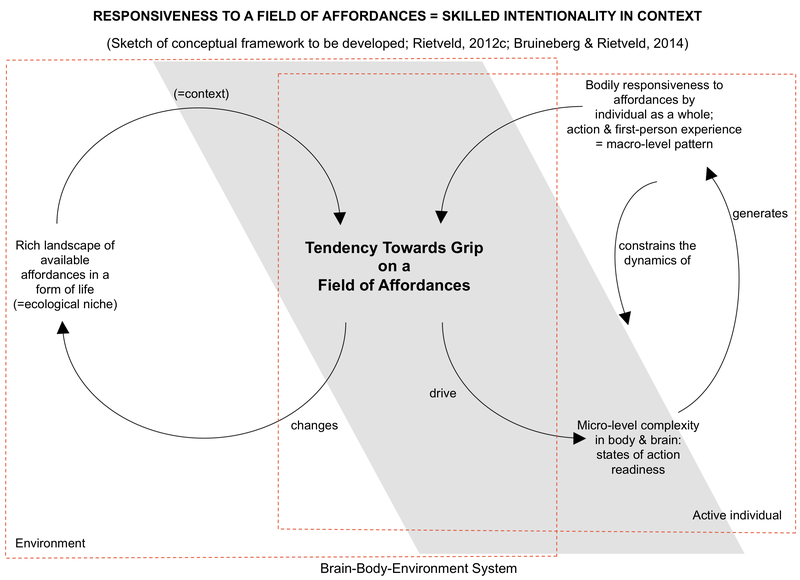 Rietveld, E., De Haan, S. & Denys, D (2013), Social affordances in context: What is it that we are bodily responsive to? Invited commentary article on Leo Schilbach et al. BBS, Behavioral and Brain Sciences, p. 436. De Haan, S., Rietveld, E. & Denys, D. (forthcoming), On the nature of obsessions and compulsions, in Baldwin, D.S. & Leonard, B.E. (eds.) Trends in Pharmacopsychiatry: Anxiety Disorders. To be published by Karger. Rietveld, E. (2012), Context-switching and responsiveness to real relevance, in Kiverstein, J. & Wheeler, M. (eds.) Heidegger and Cognitive Science: New Directions in Cognitive Science and Philosophy. Basingtoke, Hampshire: Palgrave Macmillan, pp. 105-135. Rietveld, E. & Rietveld, R. (2011), Designing spontaneous interactions, OASE – Architecture Journal 85, pp. 33-41. Rietveld, E. (2011), Bekwaam handelen zonder reflectie, in Denys, D & Meynen, G. (eds), Handboek Psychiatrie en Filosofie. Utrecht: De Tijdstroom, pp. 161-173. Rietveld, R. & Rietveld, E. (2010) Dutch Atlas of Vacancy. With graphic design by Studio Joost Grootens. Rotterdam: NAI. Rietveld, E. (2010), Alledaags handelen zonder na te denken, ANTW 102 (4), pp. 245-253. Rietveld, E. (2008), The skillful body as a concernful system of possible actions: Phenomena and neurodynamics. Theory & Psychology 18 (3), pp. 341-363. Rietveld, E. (2008), Unreflective Action. 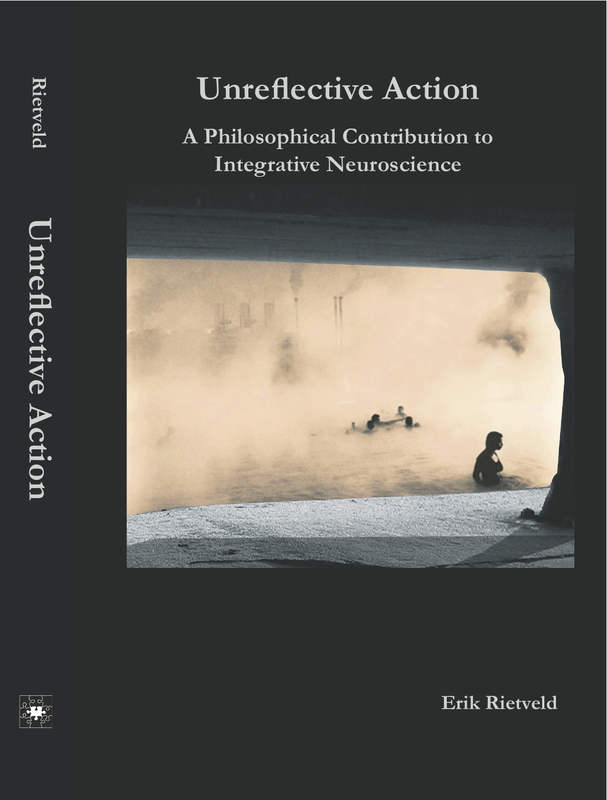 A Philosophical Contribution to Integrative Neuroscience. University of Amsterdam Dissertation. Amsterdam: ILLC-Dissertation Series DS-2008-05.